The Shed City Gable Roof Carports are Fully Structural Engineered Kits and have the Added Strength and Versatility of the Fully Bolted Frame, Low Maintenance Custom Orb Corrie Roofing & Corrie or Ezy Panel Infills in a huge choice of colours. 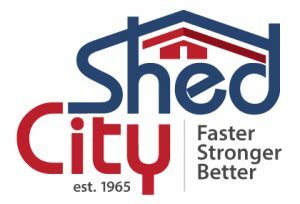 Shed City’s Gable Carports with Clear Span “C” Section Rafters and Purlins, 75mm Square Tube Posts, Standard Pitch of 12 degrees, optional 15 degrees, and a minimum Wall Height of 2.5m (8’3”), optional heights 2.8 & 3.1m, gives greater coverage for your car, caravan, or boat or provides an ideal alfresco outdoor entertainment area. 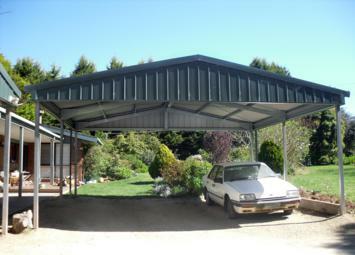 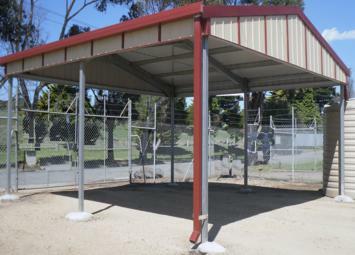 Shed City Gable Roof Carports with Infills at each end and side 300mm infills provide wonderful weather protection from all directions therefore increasing the versatility of our carport over others on the market. 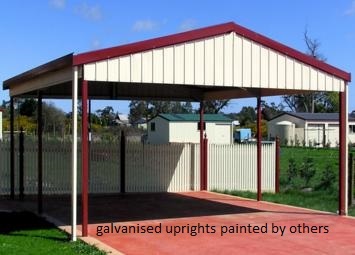 For those requiring eave heights greater than 3.1m Shed City Garages and Farmsheds can be simply adapted to a two open walled structure available up to 4.8mH eaves.